Take advantage of the crisp autumn air, bask in the radiant orange, red, and yellow hues of the changing fall colors, and work up an appetite for your favorite pumpkin treat—all while getting a good workout in and meeting new people. These seven fall fitness adventures promise all that and more. Ascend Mt. Monadnock in all of its 3,000+ feet of glory for spectacular views, and a challenging hike, with Club High Rise. The day is completely scheduled by the company, with every hour accounted for, including a lunch at the peak. The group, made up of about 50 climbers, will meet at South Station for the bus and arrive at the base of Mt. Monadnock at about 10 a.m. The hike will take around an hour and a half to ascend, and the same to descend, and is open to all ability levels—but you should be able to maintain a good walking speed while climbing a steep incline. The group returns to South Station around 4 p.m. A possible rain date is scheduled for October 6. $99, September 29, 8 a.m.-4 p.m., meet at South Station, clubhighrise.com. Truly put your skills to the test in this challenging three hour workout. You’ll begin with a guided hike to the Bridal Veil Falls in the White Mountains while carrying a rotating set of kettlebells ranging from about 20 pounds-35 pounds, shared among the participants. When you get to the falls, trainer Andrew Jackson will lead you through a workout utilizing said kettlebells. We’re tired just thinking about it. The trip is roughly 4.8 miles roundtrip and is listed as moderate difficulty. The group will travel from Boston together. $95, September 29, 10 a.m.-4 p.m., White Mountains, 1900 Easton Road, Franconia, New Hampshire, eventbrite.com. 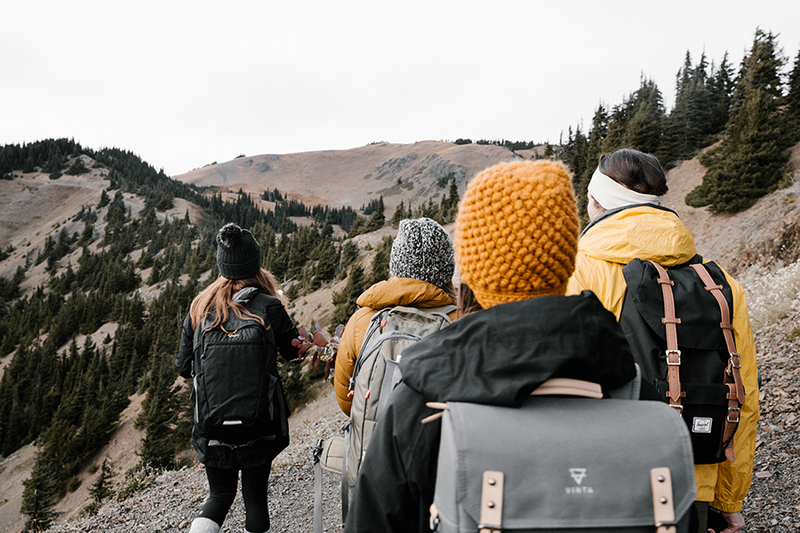 The REI Boston store is offering a plethora of different fall fitness adventures, classes, and outings throughout the season that will fulfill even the most outdoorsy among us. Choose from events like a full moon hike at Noanet Woodlands, intro to mountain biking classes at Wompatuck State Park, or wilderness survival skills classes taught at Ward Reservation. They will also be hosting local landscape photography courses where instructors will take you into the field and teach you how to shoot vibrant photos of nature in places like Appleton Farms. Sure, it’s not the most fitness-forward of the events, but we appreciate the need for a good pic. You can also take backcountry navigation or backpacking instruction classes to help you get prepared for your next mountain outing. Prices, locations, and times vary, rei.com. If you haven’t experienced a forest bathing walk yet, fall is the best time to go, what with the vibrant leaves and all. Slow down with this nature adventure as you walk through the forest, taking in the sights, sounds, and smells while being mindful of what’s going on with your body and mind. The practice is inspired by the Japanese practice of Shinrin Yoku and has been proven to improve immune strength, reduce stress, and boost cognitive function. You won’t get your heart rate up per se, but your mental health is just as important as physical health, so take a moment to zen out. $30, October 21, 1 p.m.-3 p.m., Acton Arboretum, 2 Taylor Rd., Acton, nenft.com. Lynx Fitness Club is taking their members, and any non-member or guest, into the wild for an overnight fitness expedition (if you so choose) in New Hampshire. The two different options are hike-only and hiking plus camping overnight. The hike-only version includes a guided hike, lunch, and post-hike cool down and stretch. And the overnight version includes everything the hike-only option does, plus an evening barbecue and cocktails, post-dinner activities, breakfast and a fitness workout in the mountains the next day. They’ll even provide an extensive list of equipment that they recommend each hiker/camper bring with them. Whether you’re a camper extraordinaire or this will be your first time, Lynx trainers will make sure you’re prepared for the elements. $85/hike only, $100/hike and overnight camp, October 13-14, time TBD, Franconia, New Hampshire, email Billy Najam for more info/to register: bnajam@lynxfitnessclub.com. Ditch Newbury Street and crowded strip malls on Black Friday and, instead, take to the great outdoors at one of the Trustees properties. In an effort to get more people outside, they’re re-naming the day Green Friday and offering free admission to all New England properties. Visit one of the historic houses, like the Old Manse in Concord, built just before the Revolutionary War, or the Folly at Field Farm in Williamstown—it’s surrounded by sculptures, gardens, and hiking trails. If you’re in need of a little more activity, the properties trail network extends over 350 miles and you can enjoy sights of the Boston skyline and sweeping green spaces. Head to Noanet Woods, the Ward Reservation, or World’s End for trails ranging in difficulty and scenery. How could we not include a trail run in this roundup of fall fitness adventures? Catch the sunrise on top of Wrights Tower at Middlesex Fells after a five-mile trail run through the woods, led by Hillary Allen, a professional mountain runner. A 6 a.m. wake-up call is a tall order to ask on a Friday, so of course coffee will be served afterwards, and giveaways for North Face swag will be raffled off, too. The trees from atop the tower paired with the sun rising will make for a great Insta shot, so be sure to bring your smartphone fully charged and ready to go—but we probably didn’t need to tell you that. Free, October 12, 6 a.m.-9 a.m., Middlesex Fells Reservation, Bellevue Pond, Medford, eventbrite.com.